This is an excerpt from a recent research study - part one of a three-part series released in September exclusively to our clients at our annual user conference. It's the largest study of its kind ever done, and now, we're making it available to everyone. When you download the complete study (there's a form to the right ->), you'll gain access to deep insights into brand vs. non-brand and specific industry CTR data. Click through rate studies have been compiled by various researchers and companies since the advent of search marketing. They provide a very important foundation for marketers in forecasting results, projecting SEO return on investments and building models for estimating the market size and potential. What makes seoClarity’s study remarkably different from all other studies is the sheer volume of actual data analyzed. The team analyzed over 2 billion impressions and over 2.6 million clicks collected over a 90 day period from approximately 400 Google Webmaster Tools accounts. We arrived at a robust CTR model by device, by keyword type and by industry. This incredible data set provides the most up-to-date and reliable insights into the performance of organic search rankings compared to any other study done prior. 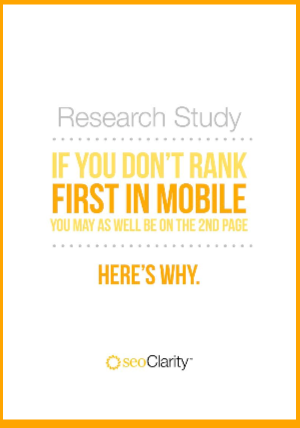 In fact, based on comparison to existing studies, seoClarity’s study is the largest study ever. Across our clients who had agreed to share data for research purposes, we had a far more significant data set than leveraged ever before by anyone for such a study. The hypothesis was that a larger data set would provide more statistical confidence and ability to drill down and segment in different ways (keyword types, industry, device types etc). 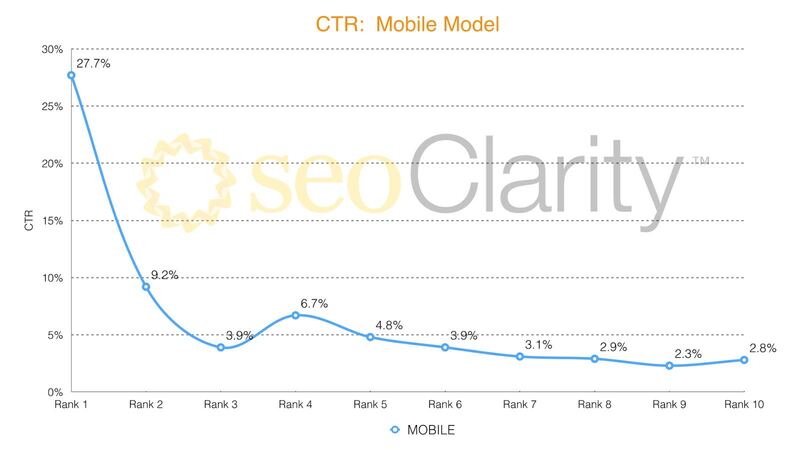 No one had done a mobile CTR study - yet. As with ANY CTR study, there are a few caveats which we’ve listed at the end of this report. We advise all readers to pay special heed to these before using the data. The methodology was quite simple. Since seoClarity already collects Google Webmaster Tools Data daily, we had ready access to all of the data in our databases (for clients who had agreed to share their data for research purposes) going back over 1 year. What made it even more exciting was the fact that it was already broken down by Desktop vs. Mobile. To make sure it reflected the most current PPC landscape and that any recent changes that may have occurred in that space were reflected in organic CTRs. To avoid any seasonal impact on the CTR model. Click-through rates can shift dramatically during the busy 4th quarter and also during shopping periods such as Valentine’s Day and Mother’s Day. Summer was the most stable period of data to work with. The numbers are the real differentiator between our study’s model and previous studies. We studied over 2 billion impressions (2,083,535,220[!] to be exact). This translates to a high level of statistical confidence for each and every rank position; In fact, there was a minimum of 35 million impressions per ranking position. From that, there were over 2.68 million clicks (268,173,670) broken down by over 2.2 million unique keywords (2,206,664). What we see in the data is a steady regression from position 1 at 19.3% to position 9 at 2%. It’s interesting that the data shows position 10 with a higher click through rate then position 8 or 9. Usability studies have shown this is primarily because many users scan the top few rankings and then scroll down to the bottom of the page. 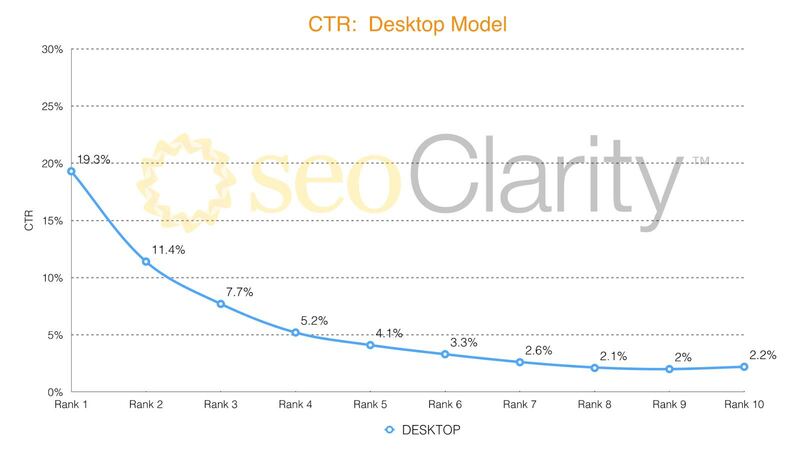 Position 1 CTR for the desktop was just under 20%; Where does that put mobile? To download the full research report, complete the form below.